Many of the peacemakers who came to Paris in 1918-19 had thought deeply about establishing an international body of stature and authority to prevent war from breaking out again in the future. Large and small nations were vociferous in their discussions and arguments about the form and role which the League should have. 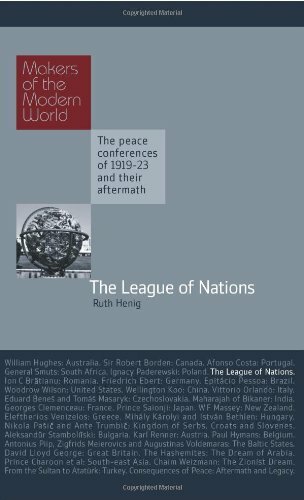 This book looks at how the League was shaped and the multi-faceted body which emerged, and how it was used in ensuing years to counter territorial ambitions and restrict armaments, as well as its role in human rights and refugee issues. The failure of the League to prevent the Second World War would lead to its dissolution and the subsequent creation of the United Nations. Following the Peace Conference, in the 1920s France and Britain were the two major powers driving the League, and they had very different approaches to peacekeeping and to the prevention of disputes. The book examines initiatives such as the Draft Treaty of Mutual Assistance and the Geneva Protocol, and analyses the succession of crises which the League had to deal with, from the Italian invasion of Corfu in 1923, to the Greek invasion of Bulgaria in 1925, the dispute between Bolivia and Paraguay in 1928, the Manchurian Crisis of 1931-3, and the Italian invasion of Abyssinia in 1935. Alan Sharp (editor) was professor of international studies, and later provost, at the University of Ulster.